Hello from Kristen in Tennessee! Who would like to help critique my essay? Please, don't hold back!!! FYI: I am still working on a final paragraph and open to suggestions. Prompt: Please explain why you are interested in being a Physician Assistant. This section is where you can write a brief statement expressing why you would like to be considered for the programs you are applying to. Keep your topic general: Follow the prompt in this section to write your statement. Keep the statement general as this essay is sent to all the programs you apply to. In your own words, write a brief statement in the space provided expressing your motivation or desire to become a physician assistant. Per PAEA guidelines, essays may not exceed 5,000 characters. My goal when I am a PA is to provide excellent care that leaves patients feeling valued, confident, and heard. At this stage in my training, I enjoy providing the amount of care I am able to while making my patients feel comfortable. “Did your grandkids like the Legos you brought them, Ms. Smith?” After updating her medical history, I’m catching up with a favorite patient as I test her visual acuities and intraocular pressure. Later, my next patient follows me back to an exam room - a child and his mother who are interested in doing neuro-rehabilitative visual therapy for his learning disabilities. Now, I shift modes and frame my testing as silly games while I listen to the mother’s story. I had studied countless hours to master my health science topics and was happy to be able to practice that knowledge while learning about my patients’ personal stories. After all, I was attracted to healthcare in part by the fact that I would be able to build meaningful relationships with patients. Suffering from an illness during my early teen years that required months of hospitalization proved to me the great impact a medical professional can have on patients. I was then determined to instill confidence and a feeling of belonging with those who I encountered in the future - regardless of my profession. I was a college freshman a few years later and I had reluctantly chosen business as a major. Since I was unsure of what my dream job was at the time, I figured it would be a safe major. The classes were somewhat interesting to me due to my natural love of learning regardless of the topic, however, I was unsatisfied with an ill-defined career path and fewer opportunities to connect meaningfully with many people. It became clear that I needed a career that challenged me to grow often and would enable me to deeply impact others in life-changing ways. Medicine was clearly the best pathway for me to achieve my goals - once I realized my strong talent with science. Following my decision to pursue healthcare, I researched and shadowed providers in multiple pathways, such as physician, physical therapist, dentist, and optometrist. Still undecided, I later learned of the physician assistant profession from classmates and advisors. I sought out information regarding the profession and found an emergency medicine physician assistant to shadow. My academic record encouraged me to trust that I would be able to succeed in whichever path way I chose, however, I saw the differences that made the PA profession unique. I was surprised at the vast amount of autonomy they held. Additionally, I enjoyed watching PAs interact with patients and ensuring that their patients understood their diagnoses - even drawing pictures to explain diseases to patients. 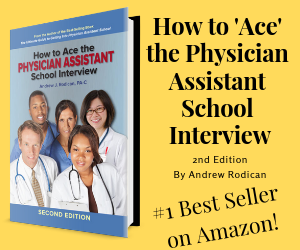 Knowing that I would likely enjoy any career in medicine, I ultimately chose PA due to the higher job satisfaction that lacked in other careers and my interest in entering the primary care workforce sooner. After my sophomore year of college, I began working as a patient care technician on a medical-surgical floor at the hospital in my hometown. The two years I spent there allowed me familiarize myself with diseases, treatment plans, and, most importantly, develop my bedside manner. Serving my patients through a healthcare team continued to affirm my decision as I observed the collaborative nature between PAs and other healthcare professions. I decided to continue my patient care hours in a different setting after college - a private optometry practice in a small neighboring town. I pre-tested 15-30 patients a day and learned that the most effective way to obtain a detailed history was by making the patient feel valued and heard. Through sharing my outgoing personality with patients, I found that they were delighted to experience personal connections (as was I). Now while working full-time, I continue to shadow on weekends and nights in emergency medicine, internal medicine, and orthopedics. I also continue my regular visits to volunteer at a senior living home where I organize events such as BINGO or ice-cream socials with residents. My experiences here move me as I see how medical professionals can help seniors live an enjoyable and meaningful life. The first two sentences of your narrative are confusing. I wasn't sure if you were already a PA tbh until I read the prompt. You can start your conclusion with that first sentence. I would take out the sentences about the business major.. maybe even about your shadowing experiences with the non-PA people. That can be discussed during the interview if they ask a question about looking into other professions. "My academic record encouraged me to trust that I would be able to succeed in whichever path way I chose " -- comes off arrogant. You don't need this sentence in your narrative since the adcoms will see your transcripts anyway. "Knowing that I would likely enjoy any career in medicine, I ultimately chose PA due to the higher job satisfaction that lacked in other careers...." -- I would take this out too. "Now while working full-time, I continue to shadow on weekends and nights in emergency medicine, internal medicine, and orthopedics. I also continue my regular visits to volunteer at a senior living home where I organize events such as BINGO or ice-cream socials with residents." -- this can be reflected in your resume. No need to put it in your narrative if you're not going to expand on them. Above are my suggestions for edit. Stray away from adding things that can just be summarized in your resume/CV. Your personal statement is your chance to highlight qualities that are not shown in your transcripts, resume, LOR, etc. Expand on 1-2 experiences with a patient or a PA to highlight WHY YOU and WHY PA. Be specific and for the most part, just focus on the PA profession.